Editor’s Note: This post has consistently been among the Top 5 most popular (on my site) and I have added new photos and new details to the original. 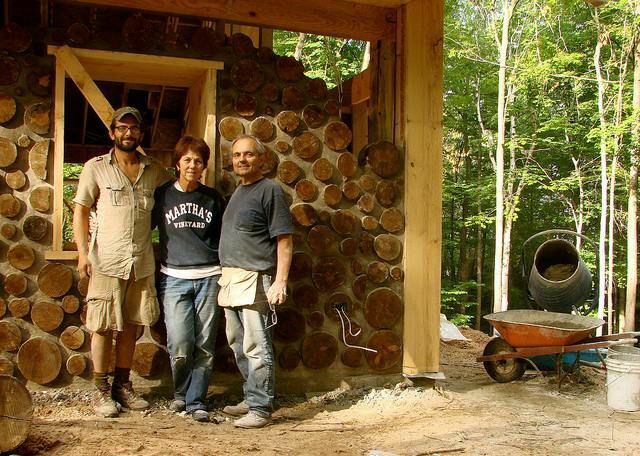 Adam & Erica Konopka and their children started building a Cordwood Cabin near the shores of Lake Michigan. 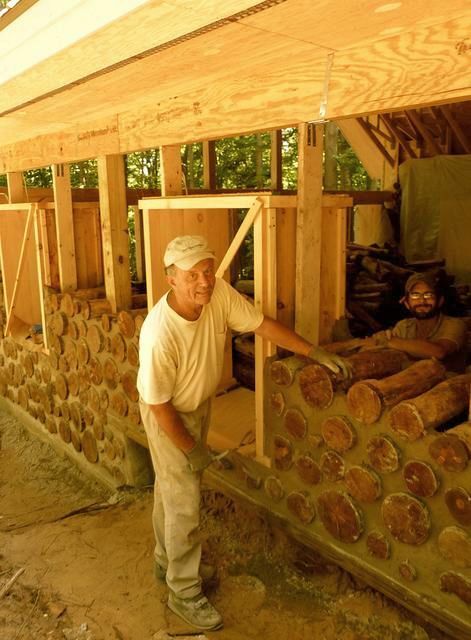 The cabin has 24″ thick walls with foam insulation in the center cavity. 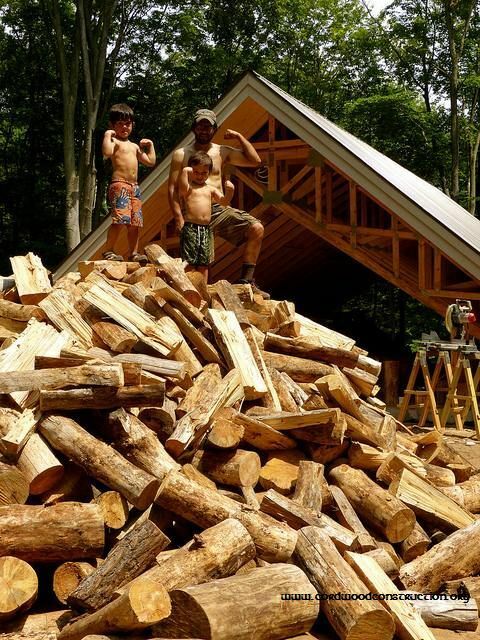 A cordwood cabin requires a lot of cordwood log ends and big, strong men! Clean-up of the yard required a pink dress, green mud boots, and a hair ribbon. How sweet! 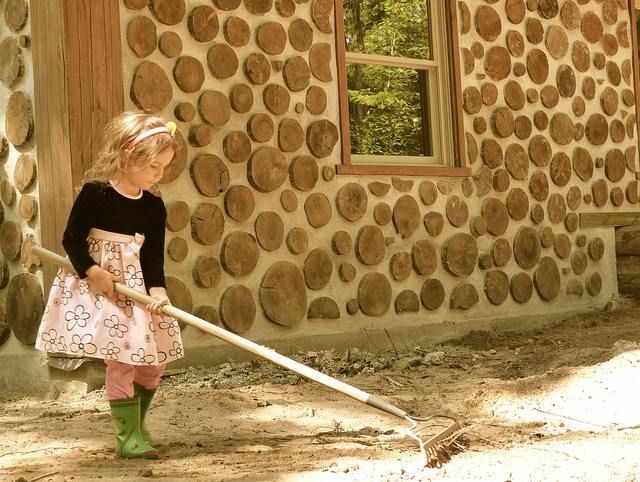 This reminds me of my daughter Katy cleaning up our cordwood site 30+ years ago in her red gingham dress. Here is some detailed information about the "build" from Adam. 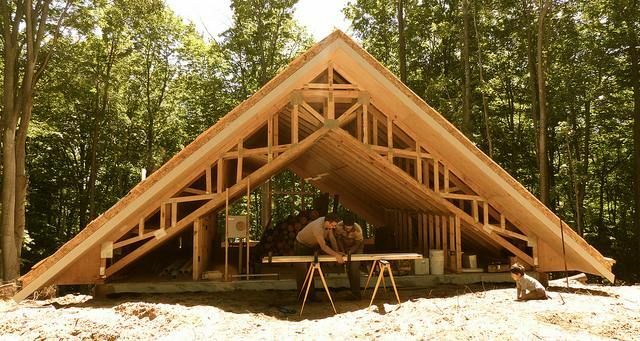 "The design concept for the cabin is relatively straightforward – approximately 1,000 square feet (26x40), post and beam frame, built into an 8 foot sloped hillside (basically a half basement of concrete walls), single gable with 6/12 pitch, partial loft, and cordwood infill. The cabin is located in Michigan, between Ludington and Manistee." There is an earth berm on the north wall that allows for moderating of temperature. Spraying the foam into the center cavity became a family affair. Cleaning up around the log ends is a task that requires patience and the right tools. "I have begun to reflect on the process and have a variety of appreciations and a few concerns with how it went for us. 1) Thermal mass is where it’s at. It doesn’t get enough credit. 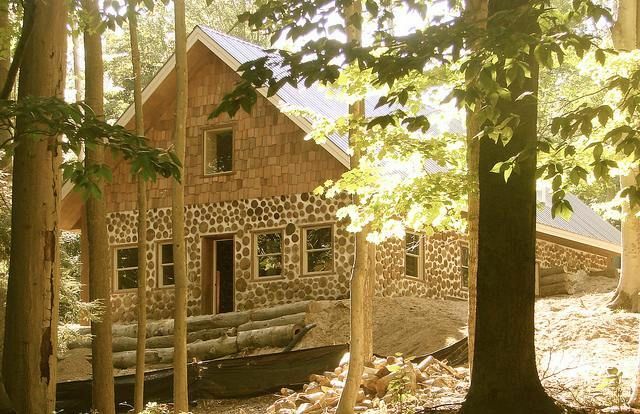 Our cabin is basically half earth sheltered and has cordwood walls for most of the remaining exterior. We could feel the interior get cooler as the walls went up. Amazing! 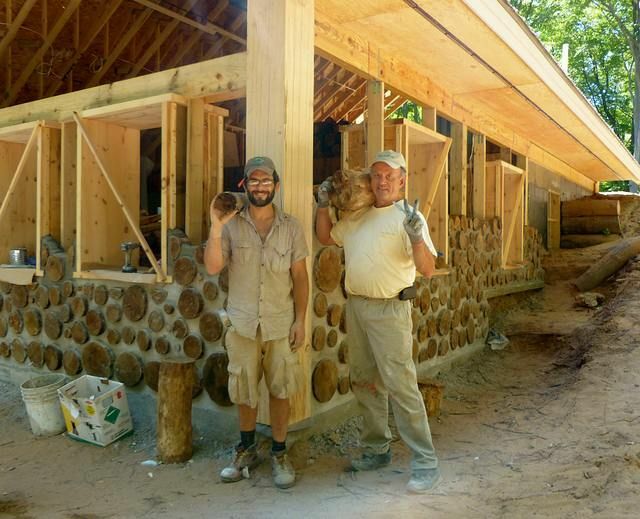 We are planning on using the cabin in the summers and are optimistic that our building design and two-foot cordwood walls will keep us cool during those hot summer months. 2) Loved the foam. We used froth-pac insulation kits that we special ordered through Lowes. Originally, we were planning on using the spray foam for the first few feet of our walls and then switch to sawdust - we decided not to put in a knee-wall and were concerned about moisture. 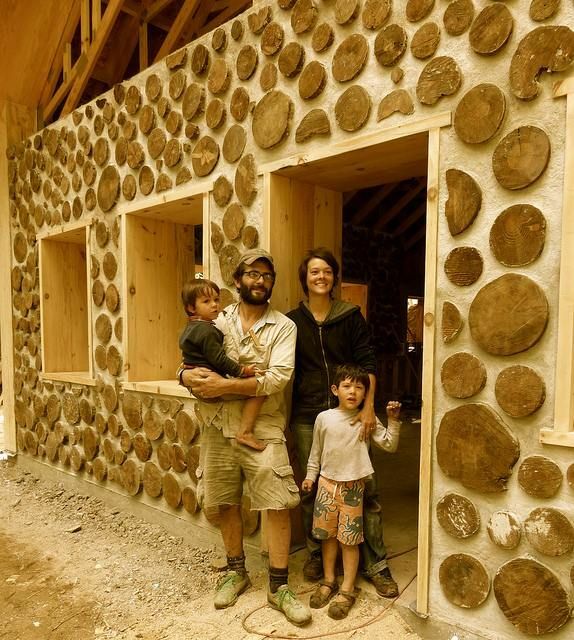 But we fell in love with the foam: user-friendly, contributes to wall stability, superior R-value, and not susceptible to rot and bugs - and decided to use it throughout our cordwood walls. The major drawback remains cost - we spent approximately $5,000 on it. Brutal, but we still feel like it is worth it. 3) Rod Cox: We have had a great experience working with him and would highly recommend him to others. He understood our design concept, enhanced it, and made it be more cost effective. 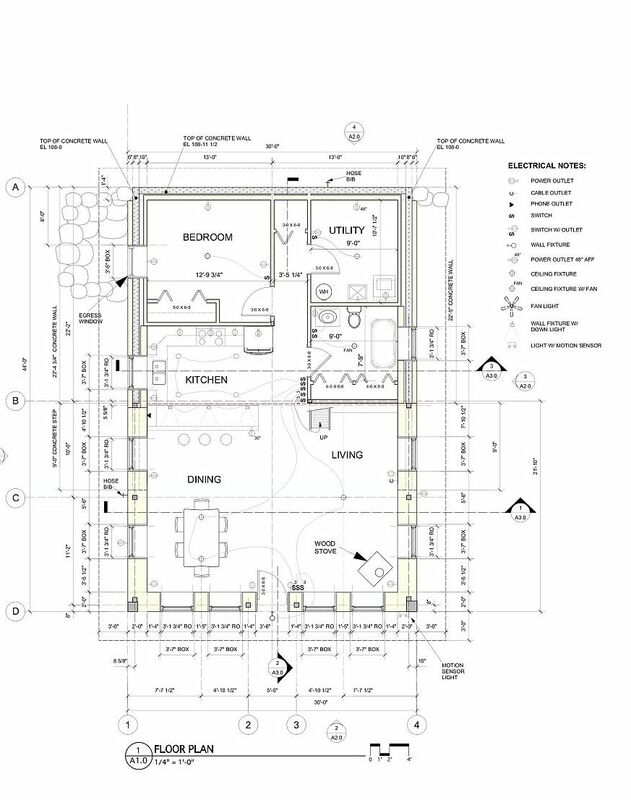 The drawings were detailed and exceeded the standards of most of the people who worked with them." 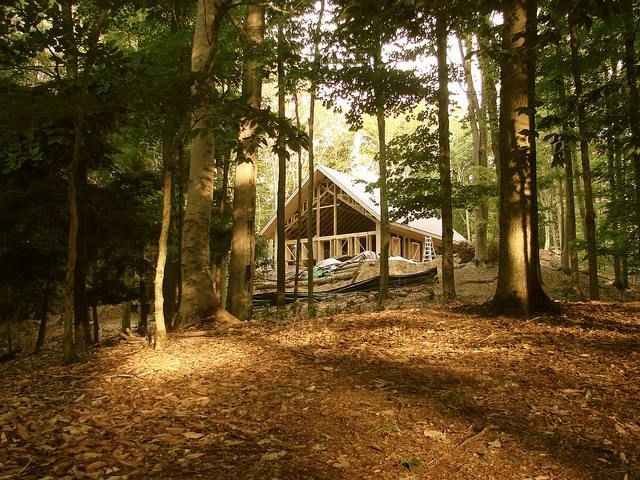 4) Building Design: Our cabin is basically a hybrid between a traditional post-and-beam and modern construction techniques. 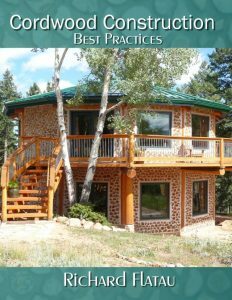 We started out pursuing a timber frame structure, but were limited by our time frame and budget... 5) Cordwood is time-intensive: We wrapped our post-and-beam structure and veneered (with approximately 8-inch cordwood) our concrete walls. While the work was generally easy and enjoyable - it took a long time. 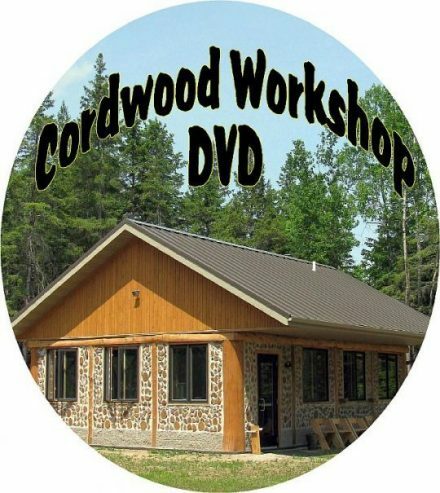 Going into the summer, I planned a month of labor for cordwood and it took a month and a half. It would have taken longer if we had not been rescued by family and friends. We would not have gotten it enclosed (our minimum summer goal) without them. It took us longer because we had additional cuts needed to wrap our post-and-beam structure. The way we hung our windows added labor time too. 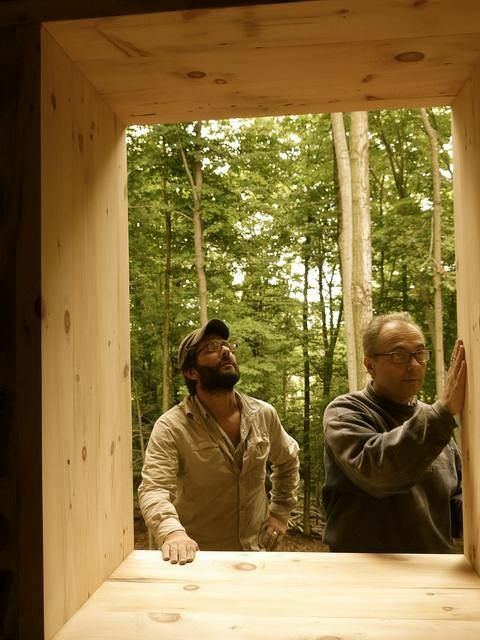 We locally sourced true 2×8 white pine and constructed our window frames. We think they turned out beautifully and, given the two-foot width of our walls, will make a distinctive contribution to our living space. 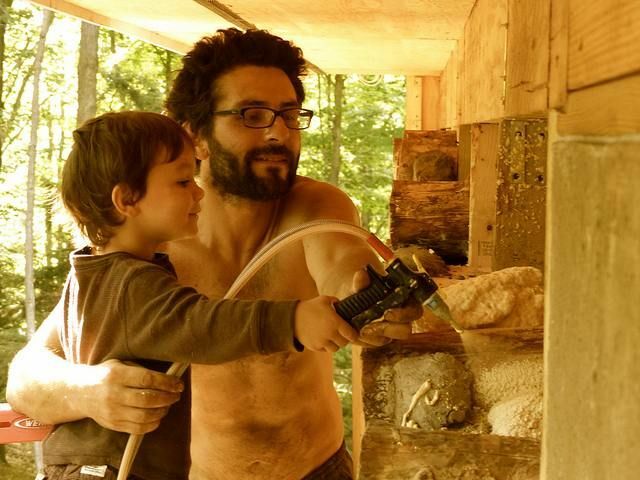 We hung the window frames before we started laying cordwood due to 1) labor availability (we wanted to maximize my brother's help) and 2) installation efficiency (easier to align). 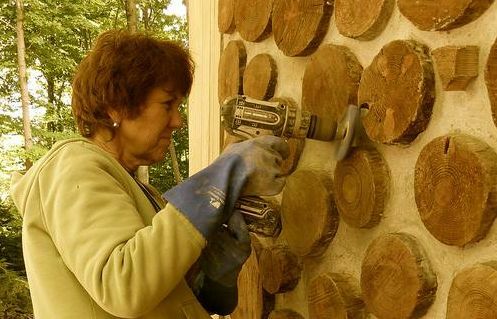 The tradeoff, however, was additional time needed for wall construction - we had to make extra cuts. I would do it differently next time and would advise others likewise. 6) Red pine: We sourced our red pine from the Manistee National Forest through a hunters/firewood program. Free! The forest services over-planted red pine in the area back in the 1930s and 40s. We are really glad to find a use for some, even if it is only a small amount. We were able to get the moisture content down to 14-16. We dunked each log in Borax, sprayed much of the logs with Shell-guard, and stained the ends. Generally happy with it. We left approximately 80% of the logs round and split 20%. I am concerned about bugs - we are in an old growth forest and, over the summer, we have seen the most amazing bug life in the woods. Freaky too. I am anticipating maintenance down the road for our red pine and am hoping for the best. 7) Mortar cracks: We had small cracks around most of our window frames. How do you avoid that? The wood was kiln dried and we used keyways, protruding drywall screws, and even applied sealer. I thought we might do better. My impression is that it is probably par for the course and nothing Permachink can't help. Minimal cracking so far on our logs (dozen or so), even given that some of them are large and left round. So far, we are doing better than I thought we might with them." Thank you, Adam & Erica, for sharing your wonderful journey.